Stunning 16th century Sabbatical home away from home at the heart of lively city!
. Our home the "Logis de la Roche Corbin" is a 16th century "hotel Particulier" (noble mansion) that we lovingly restored over the course of 15 years. It is a haven of peace and beauty at the heart of our city ,Angers, in a charming medieval neighbourhood with restaurants, markets, schools, museums and many other amenities within very short walking distances. We have exceptional views over ancient gardens and the Logis is very quiet and thus perfect for rest and/or study! The Logis can host 6 people very comfortably ,one family, or two couples + children, and allows privacy for all. A green, flowery and fragrant patio provides an outside area to read or have a drink, weather permit.Angers is a young university city which offers an incredible variety of activities,intellectual, artistic, physical; The countryside is minutes away, by bike, theaters and concerts minutes away by foot. Our art house (400 coups cinema) was voted best cinema in France. buses, tram take you anywhere in a few minutes. but a great asset is to be able to relax,shop, take a walk in a peaceful village-like area and still be at the center of the city,with restaurants , café terraces, museums, city life. Of course the surrounding areas offer lots of castles,picturesque hamlets to visit, wine and food to taste, rivers to explore, actually one sabbatical year isn't enough!We are a Franco-American couple,a real team; Michael is an artist (cinema and painting),and our home is one of his masterpieces!I, Pascale, am an"active" recently retired English teacher, busy with several interests, helping Michael with his film adventures (since 2004! ).Our two children are now 25 (Céleste, actress/director) and 27 (Elliot, architect),and have left the nest they cherish.. so we thought we might take off, too..
We are quite used to meet and introduce visitors to interesting friends from the local University or the city and it is a pleasure for us. We created the first guest room B&B in Angers 8 years ago and we really enjoy it.. so do our guests, as their reviews say.We have also had weekly rentals particularly in the summer, and everybody has loved their stay here.We enjoy making people happy and feel comfortable. Michael also have his beautiful and vast painting studio ,looking over two other gardens, just across the street, with private parking and a lovely flower/organic vegetable garden, that could also be part of long term arrangement. We are open to short term rentals but we are really looking for a long term rental starting next May 2016. We also have the possibility of arranging both a stay at the Logis and combine this with a stay at our wonderful Paris flat now listed as Sabbatical number 97180 . Of course we are ready for a detailed correspondence with our future renter and to deepen the possibilities for the best arrangement for all. Please contact us and let's make your sabbatical year a memorable and fantastic one: a dream come true. looking for a long rental (sabbatical=everal months) but would accept shorter periods. University nearby Université Catholique de l'Ouest.and lots of engineering schools. Other: 18th century fireplace. bike rack. I am an American painter,filmmaker and house renovator who has been living in France for the last thirty years with my companion Pascale Rivault a retired French school teacher from the public school system. We have two children our son an Architect and our daughter an actress filmmaker . For the last fourteen years I have been making films on films and promoting the legacy of my father's work and the work of the Independent American Filmmakers of the 50 and 60's. I am passionate about design and renovation and basically rebuilt our wonderful "L'Hotel Particulier" from head to toe over twenty years. We also do a B+B and weekly rentals in our Logis and have hosted many researchers and academics. We also have a second garden and parking space across the street at my studio where ewe do yearly shows of artists from France and around the world. We had a wonderful two weeks in this fine apartment. It is bright, clean and well located. 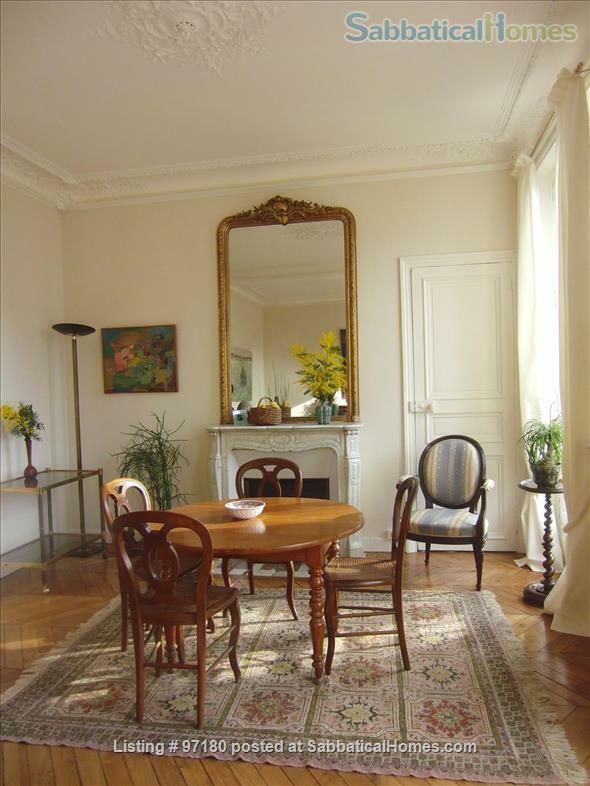 Close to several intersecting metro lines and a short 5 minute walk to the Luxembourg Gardens. We used the apartment as a convenient base for activities on both the Left and Right Banks as well as Rolland Garros. Michael and Pascale were great to work with. They provided extra photos of apartment, were able to work with our arrival and departure schedule and went out of their way to orient us to the flat and the nearby area. We would certainly hope to return for the excellent accommodations, pleasant and easy to work with owners and convenient access to central Paris.